“My work is a personal response to memory and experiences associated with spending a large part of my life immersed in rural environments. My paintings are not an attempt to elevate, idealise or romanticise the rural, but rather a means of exploring the notion of what it is, and what it means to be a ‘local’, and developing a visual language to convey this. New Zealand has a rich and varied history of landscape painting yet I feel little has been attempted within the visual arts to explore issues of localised rural experience and landscape. Historically New Zealand landscape painting depicts ‘visiting the landscape’ with all its implied transferral of ‘Urban Experience’, - a romanticising experience.” In the Field Study series of works the animals have become the object of intense scrutiny. The background has been removed, “with the object becoming a landscape within themselves.” With gallery installation, the viewer is placed within the landscape and forced into “a degree of scrutiny many would be unfamiliar (if not uncomfortable) with… the reality of raising animals for slaughter and viewing the land for production necessitates objectification. 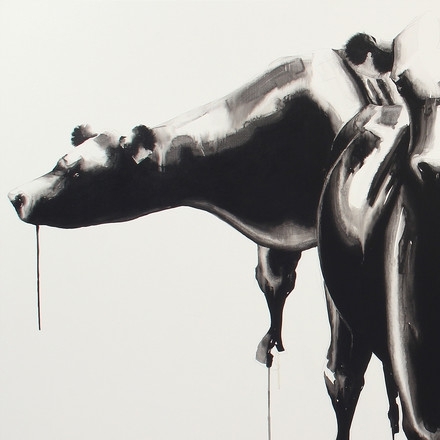 While the cattle paintings appear deceptively simple, “the images are actually built up through a sequence of processes.” In the Field Study series the oil adds “to the dripped and drawn effect of the ink to give a sense of the wetness of living skin, a challenging immediacy. The factual, unromantic approach to beef farming (the images in the Steer series being marked with crayon as for meat-cuts or production lots) brings a confrontational edge to the vision of our landscape as picturesque or pastoral.” 'When most of us look at cattle we interpret their returning gaze as gentle curiosity. Petre sees the eye contact as more of a challenge, an awareness of their fate and a 'bring it on' belligerent bravado by animals that inherently know they are born already defeated.' Mike Petre was born in Piopio, New Zealand, in 1964. He gained a Bachelor of Agriculture (Management) from Massey University, in 1986. He later pursued further study, graduating with a Bachelor of Design from Carrington Polytechnic in 1994. Following his graduation from design studies, Petre was a founder member of Sturdee Studios and in 1998 of Indicator Studios. He began exhibiting via the studios in 1995 and since 1997 has exhibited in dealer galleries in Auckland, Wellington and Dunedin. He has been a finalist in the three Wallace Awards he has entered (1998, 1999 and 2001) and in 2001 was featured in episode four of Television New Zealand’s The Big Art Trip. 1. Mike Petre, Artist Statement, 2002. 2. ibid 3. Helen Watson White, “Field work,” Sunday Star Times, June 16, 2002. 4. BMW Magazine, Autumn 2008.